This month we opened our production of Relatively Speaking, welcomed community and youth groups from across the borough to perform on our stage and started preparations for our next production, Shelagh Delaney’s A Taste of Honey. 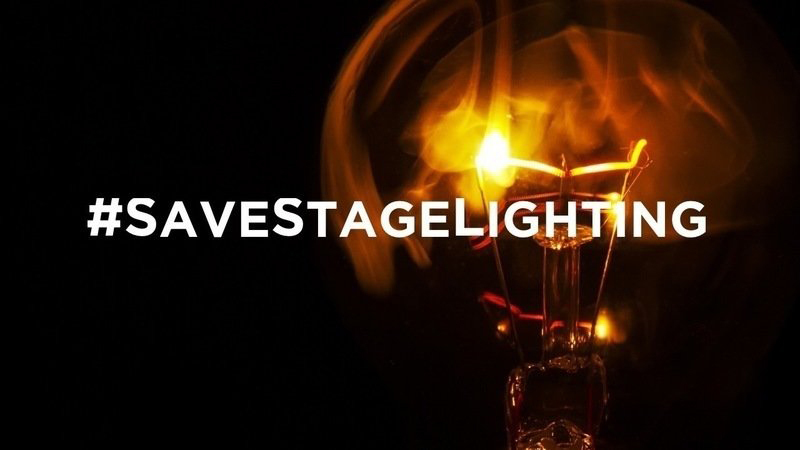 We’re also imploring everyone who enjoys coming to the Coliseum to sign the petition and help spread the word about the #SaveStageLighting campaign to protect the futures of all theatres and venues. 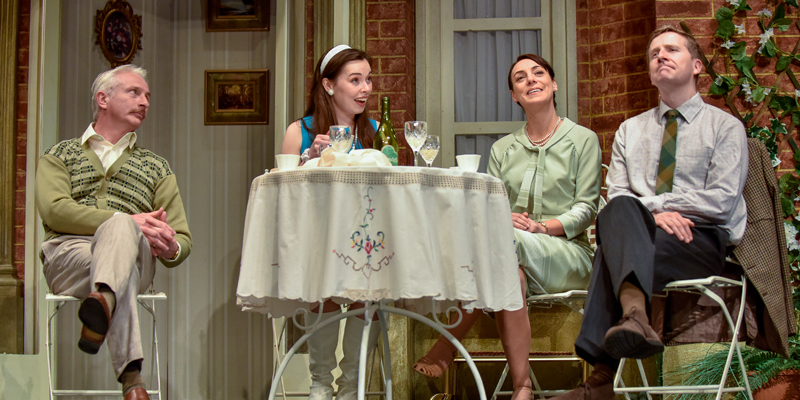 Relatively Speaking was Ayckbourn’s first West End hit. It first opened in July 1965 as Meet My Father at the Library Theatre, Scarborough, directed by Stephen Joseph. On 29 March 1967 it transferred to the Duke of York’s Theatre in London’s West End, where, under the new title of Relatively Speaking, it ran for more than 350 performances. Our production is directed by Robin Herford, who spent much of his early career working with Alan Ayckbourn at the Stephen Joseph Theatre in Scarborough and has appeared in the original production of more Ayckbourn plays than any other actor. In 1977, Robin performed as Greg in Relatively Speaking at the Stephen Joseph Theatre, directed by Ayckbourn himself. Relatively Speaking runs until Saturday 5 May. Tickets are available online here, at Box Office or by phoning 0161 624 2829. The European Union (EU) is proposing to change the rules that govern the light sources used in theatrical productions, bringing the vast majority of quality theatre lights under the same rules that govern domestic and office and industrial lighting. The existing version of these regulations includes an exemption for stage lighting, but these changes will dramatically affect the equipment available, and in doing so have a hugely detrimental effect on the whole entertainment industry. Under the proposed new regulations, which are due to come into force in 2020, the minimum efficiency requirement is unobtainable by all current theatre lighting fixtures which use traditional tungsten light bulbs. It also turns out to be unobtainable by many of the new generation of specialist LED theatre lighting fixtures, and the general opinion from manufacturers is that achieving these energy standards will be impossible by 2020, and possibly beyond. The goal of the new regulations is to improve the efficiency of lighting products, however studies in recent years have shown that stage lighting typically accounts for less than 5% of a theatre’s total energy consumption. This is because each lighting fixture used for a production has a particular function; the fixtures are rarely, if ever, all on at the same time. And performance lighting is usually only on for a few hours a day, during a performance. The money spent on replacement of existing theatre lighting systems with poorer quality equipment is money not being spent on reducing the other 95% of a theatre’s energy consumption, where much greater energy savings are possible. 60 years ago, a teenage writer from Salford took the world by storm with her groundbreaking debut play, A Taste of Honey. Shelagh Delaney was Britain’s first working-class female playwright, and her play caused an immediate sensation with its unflinching depiction of class, sexuality and race. Recognised as the pre-cursor to Corornation Street and one of Morrisey’s lyrical inspriations, A Taste of Honey is a gritty play about a mother and daughter trapped in a destructive and resentful love-hate relationship. Jo’s ambition is to separate herself from her alcoholic mother, Helen, who dominates her life. Can she stop herself from becoming the one thing she never wanted to be – just like her? A Taste of Honey was one of the finest examples of the ‘kitchen sink drama’ born in the 1950s; in the wake of the Second World War a new breed of writers decided that it was time to give working class characters, and working class stories, a heart and soul. It premiered at Theatre Royal Stratford East in 1958 and transferred to the West End the following year. In 1961 it was adapted in to a classic film starring Rita Tushingham and Dora Bryan. The Coliseum’s production of A Taste of Honey will be directed by Associate Director, Chris Lawson, and features Gemma Dobson – who made her professional stage debut as Sue in the famous re-instated run of Rita, Sue and Bob Too at the Royal Court, London earlier this year, as Jo; and Kerrie Taylor, who is best known for her previous role as Beth Enright / Beresford in ITV’s Where The Heart Is, as Helen. 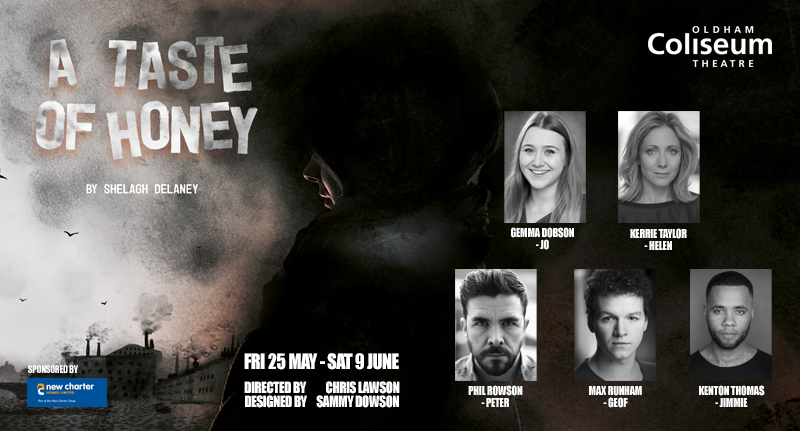 A Taste of Honey runs at the Coliseum from Friday 25 May – Saturday 9 June. Learn more and book online here. This week Rogue Bones have been at the Coliseum as part of our new studio take over programme. On Wednesday they presented Selfies Kill More People than Sharks, and this evening is their rehearsed reading of Making Love by Amie George. Selfies Kill More People than Sharks is a show which takes an irreverent look how we use social media and smart phones. The brilliant cast of local actors include: Ryan Gilmartin (who recently wrote a piece for the Coliseum’s Secondary Education Partnership Scheme), Amie George, Houmi Miura and Charlie Ryan. Making Love is a work in progress, developed through the London’s Royal Court Writers Programme. It looks at love in the modern age, loneliness and err… silicone dolls. Is it possible to have a relationship with someone who isn’t real? Rogue Bones formed in 2016 and coordinated Shoots Scratch Nights at The Lowry, showcasing new work. This was also performed at Paines Plough’s Roundabout for the opening of the award-winning show Growth by Luke Norris. As part of Greater Manchester Fringe Festival 2017, they premiered their production of Vinay Patel’s Free Fall. The company was founded by Amie George and Kash Arshad. In addition to co-directing Rogue Bones, Amie is a writer and actor whose work has featured before at the Coliseum as part of the First Break Festival 2017. She will also be leading our Scribbles play writing workshops this term. Kash is currently Trainee Artistic Director at Freedom Studios and Associate Director on Ben Tagoe’s When We Were Brothers. He was also, once upon a time, an Assistant House Manager at the Coliseum. Learn more about Making Love and book tickets here. Learn more about Rogue Bones on their website. See what’s coming up in the Coliseum Studio. The Coliseum’s annual Civic Night welcomed friends and supporters from Oldham’s vibrant business community and Oldham’s Mayor, Councillor Shadab Qumer, and Mayoress, Sobia Arshi. Guests from Capita, Oldham Hulme Grammar School, Innovative Technology, Jigsaw Housing and The Stoller Charitable Trust joined the Coliseum’s team and our Council colleagues to enjoy the theatre’s world premiere adaptation of Whisky Galore. At an interval reception guests heard from Cllr Shadab Qumer and Chair of the Board, Gail Richards, who discussed how culture and the arts play a key role in Oldham’s future and success. Philip Goulding’s new adaptation of Compton Mackenzie’s comedy classic proved a hit with audiences, with a cast of seven women playing a total of 26 characters. Following its three week run on the Coliseum’s stage, Whisky Galore is now on a national tour, visiting eight theatres across Britain including: The Haymarket, Basingstoke; York Theatre Royal; Hull Truck Theatre; New Vic Theatre, Newcastle-under-Lyme; Theatre Royal Bury St Edmunds; Cast, Doncaster; Belgrade Theatre, Coventry and Salisbury Playhouse. The Summer term of Scripts & Scribbles has just begun with sessions running fortnightly on Wednesdays, 11-1pm at the theatre. This week was the first session of Scribbles, our writing group for anyone who has an interest in writing for the stage from absolute beginners to published writers. Whether you want to learn different techniques, meet other writers or make the commitment to writing regularly, Scribbles is suitable for you. This term, the group will be led by Amie George, Co-Artistic Director of Rogue Bones Theatre Company. Amie’s play Making Love will be performed as a rehearsed reading in the Coliseum’s studio on Thursday 26 April. Her work was also featured in last year’s First Break New Writing Festival. The next session of Scripts will be on the Wednesday 2 May. Scripts is a friendly play reading group, exploring a variety of texts chosen by Associate Director, Chris Lawson. During the last term, the group looked at everything from well-known texts such as Alan Ayckbourn’s Confusions to Milk by Ross Dunmore which was recently performed at the Edinburgh Fringe Festival. “Reading a script out loud brings it to life even though we’re not physically acting it out. It means we can have fun reading roles we may not be suitable for, but we can voice with conviction. And if we are not masters of regional or national accents, we just carry on using our own natural one! As well as reading the scripts we discuss their merits. 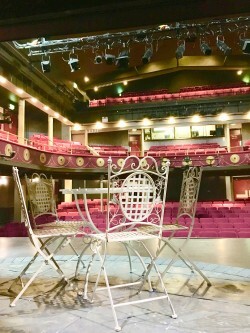 As a group we have a love for theatre as writers, performers or just regular audience members, so we enjoy a bit of analysis and speculation about how something might work for staging in the Coliseum spaces. This year, the Scripts and Scribbles groups will be working together, producing scripts and reading as part of Cultivate Festival (Monday 25-30 June). The Scribbles sessions from now until the end of the term will focus on developing short pieces for performances, with guidance from Amie George and feedback opportunities with the other members of the group. The Scripts group will have the opportunity to take part in the performance by reading the final pieces. Cultivate will take the place of First Break Festival, offering a wide range of workshops and participatory opportunities over a week. Associate Director Chris Lawson works closely with emerging artists across the Coliseum’s programme. Scripts and Scribbles sessions are £3 and can be booked through the Box Office. The Cultivate show will be on sale soon, so if you’re not able to attend the sessions, come along and watch! 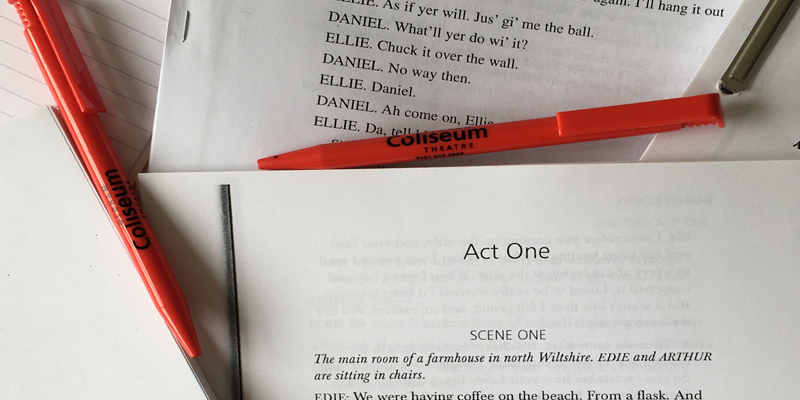 If you have any questions about Scripts or Scribbles, please contact Rose Sergent, Admin Officer, on rosesergent@coliseum.org.uk. to book, contact Box Office on 0161 624 2829. On Monday 14 May at 7.30pm we’ll be announcing our programme of plays and events for Autumn/Winter 2018-19 at our twice-yearly Season Launch event. At May’s Season Launch we’ll be announcing the plays and events that are coming to the Coliseum stage between September 2018 – March 2019. On Tuesday 10 April, the Coliseum welcomed five community and youth groups from across the borough to perform on our Main Stage as part of the Community Partnership Scheme. Launched in 2015, with funding from Respect Our Community Awards (ROCA), the Community Partnership Scheme gives groups the opportunity to create and share a performance based on the themes of a play in the Coliseum’s programme. The performances celebrate the collective identities of the groups involved and bring them together on Oldham’s historic stage. This year, Northmoor Academy Coffee Morning Group, Oldham Young Carers, 42nd Street Creative Agents, First Choice Homes with Greenacres Primary School & Waterhead Academy and AKSA & New Charter Homes Women’s Group created performances in response to Tom Wells’ The Kitchen Sink, a modern family drama which had a hit run at the Coliseum in February this year. Featuring a performance from each of the five groups, Home explored traditions, families, neighborhoods, memories, communities and aspirations. We spoke to Minaz Aslam, Community Development Officer at Jigsaw Homes, about the AKSA & New Charter Homes Women’s Group’s performance. AKSA & New Charter Homes Women’s Group meet at the Coliseum every week to share and discuss issues that are important to them and get involved in creative activities. Working with theatre maker Caitlin Gleeson, their performance, The Moon, The Stars And Eid, shared and celebrated their favourite parts of Eid at home through storytelling, movement and comedy. Why did you decide to get involved in the Community Partnership Scheme? The ladies have grown in confidence over the last year and were keen to give this a go. It was something new for all the ladies and it sounded like lots of fun. Sommerset house were involved in the Community Partnership Scheme last year from New Charter and they loved it. How did you come up with the ideas for your performance? As a group we discussed different positive themes that linked to home and family events that we could easily showcase and we all voted on Eid. Some of the other considerations were a family wedding, a family trip to Blackpool and a family dinner party. How was your experience performing on the Coliseum’s main stage? It was a great experience and we were able to practice for the main show. It was so nice to be able to put voiceovers, lighting and music to our performance. Performing was fun and we received a great reception from the audience. What will you take away from your experience being involved in the Community Partnership Scheme? The ladies have tightened their friendships within the group by working on this performance, everyone played a part and has grown in confidence. They would welcome getting involved in something similar again in the future. Introducing Tom: Box Office Assistant, Front of House Duty Manager, former Front of House Assistant and script writer. I joined the Coliseum in November 2016 to help out with the pantomime that year, Sleeping Beauty, and then I was asked to stay and soon became a Duty Manager. I was gutted to miss out on Gaslight last year, which everyone told me was brilliant. I think Spring and Port Wine was probably my favourite that I have seen. I get to see all the sets, and Spring and Port Wine was only typical and indicative of the great sets and production value which the Coliseum always produces. I love the people and learning new things constantly. It’s great to have the opportunity to witness the inner workings of theatre production, marketing and administration in several areas at several levels, seeing how it all comes together to produce what the Coliseum produces very well. As well as this, as an employee here I hugely value being able to frequently see the work produced all year round. I now work in both Front-of-House and Box Office and really enjoy being able to work cross-departmentally at the Coliseum, and have enjoyed and valued being able to continually progress here. I’m massively looking forward to A Taste of Honey. It was a play that I fleetingly came across at university and I can’t wait to see it fully for the first time. I’m from Teesside and I love writing and have had two of my plays produced, as well as two short films. I’m working on a series of further short films later this year. Oh, and I can juggle. Here at the Coliseum, we’re committed to being an accessible venue for all our visitors. As part of this, we have an Infrared Assisted Listening System which helps audience members pick up sounds from our performances more clearly. The Infrared Assisted Listening System is helpful for anyone who struggles to hear performances, even if you don’t wear a hearing aid. It works by reducing background noise and enhancing the volume of the performance via headsets or audience members’ own hearing aids. A microphone picks up sound from the stage and transmits it to headsets or hearing aids via the use of our necklace loop receivers. This means you can focus on sounds, such as an actor speaking on stage, from the receiver rather than all noises in the auditorium. Our Front of House and Box Office staff are happy to offer you further information and assistance. For full details on the Infrared Assisted Listening System and the best seats to book to use this facility, visit the Access page on our website here. Regular visitors to the Coliseum may recognise Kyle Wilcock, one of our Customer Experience Volunteers who help to look after our audiences before, during and after performances. I’ve always been interested in history – especially the Victorians. I used to volunteer in a museum with my Grandad so maybe it started there. In September, I’ll be starting my degree in History. I’m also a theatre fan and help out at the amateur dramatics society in Milnrow whenever I can. How long have you been involved with the Coliseum and how did you first get involved? I’ve been a volunteer with the Coliseum since 2015 although my Gran and Grandad always took me to watch the panto when I was younger. As I got older, I started watching the season shows with them too and it was then I saw a poster advertising volunteer roles at the theatre. I always thought the Coliseum had a friendly atmosphere and was different from some of the more commercial venues. It’s always been somewhere that’s been important to me and I’ve been involved with different opportunities including TheatreLAB and performing a reading for the theatre’s 125th anniversary. What’s the best thing about volunteering here? I like meeting members of the audiences and chatting to them about the shows, they always have interesting stories and memories of the theatre! What’s been your favourite show since you started volunteering? I’ve always loved the pantomime so volunteering with that is fun. I also really enjoyed Hot Stuff; I thought the set and costumes were really good! Have you learnt new skills since becoming a volunteer? Volunteering has definitely helped me to become more confident. I’m looking forward to the new building, I had a look at the plans at the Fun Palace open day and will be interested to see how the spirit of the Coliseum is incorporated in the new build. I started volunteering at the age of seven! I used to help my Grandad at the museum he worked at. 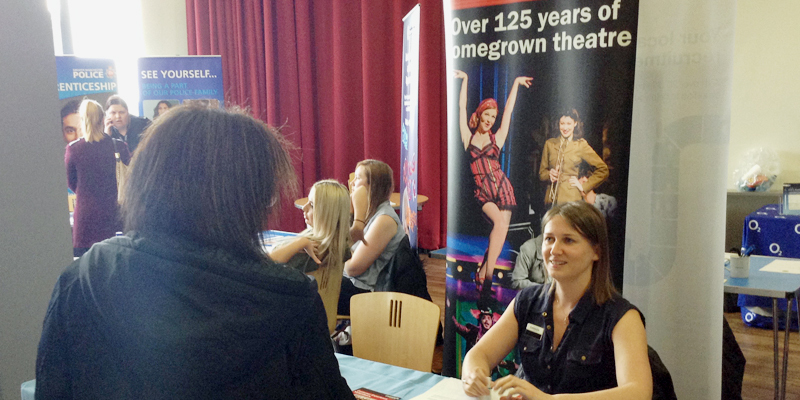 Coliseum House Manager, Heather Shaw, visited the Get Oldham Working event at Oldham Library and Lifelong Learning Centre last week to talk about volunteering opportunities at the theatre. Get Oldham Working has created over 3,000 jobs, Apprenticeships and work experience places in Oldham since 2013. It offers people the chance can get right to the heart of the local job market with twice yearly jobs fairs and specialist employer events, and offers help with CV writing and job applications with local job clubs across the borough.